Size/shape: 8mm round, fluted (vertical grooves). 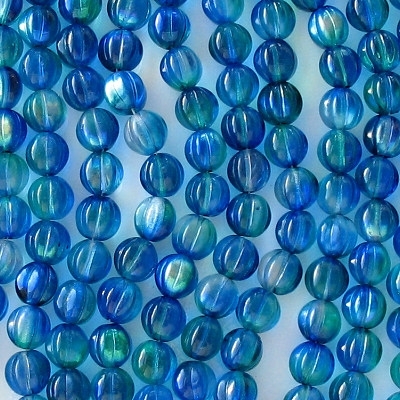 Colors/description: Clear beads with a synthetic blue and green coating, with a silver AB coating on top of that. AB (aurora borealis) coating reflect a rainbow of colors, although mostly they just look silver. Comments: Important: The picture shows the old beads. 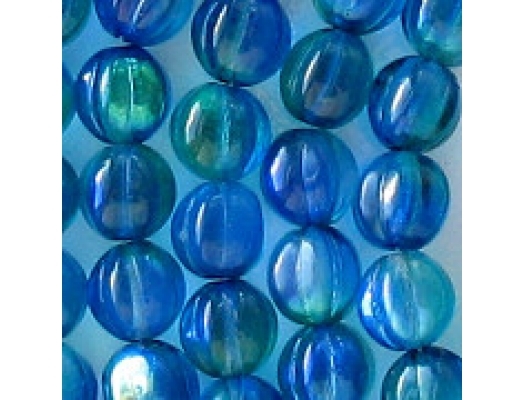 The new batch is made of a lighter blue glass, and as a result the green color is more prominent than it was before. 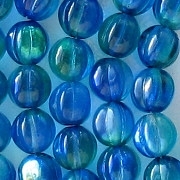 The new beads appear about 50% blue and 50% green, whereas the old batch was mostly a rich blue. I will take a new picture when I have the time.